The Dallas Cowboys had won 14 straight opening games as they started another season against the St. Louis Cardinals on September 2, 1979. A perennial contender under Head Coach Tom Landry, Dallas had won a second consecutive NFC Championship in ’78 before losing a close contest to the Steelers in the Super Bowl. The Cowboys were still sound on both sides of the ball, with QB Roger Staubach the NFL’s most efficient passer, outstanding receivers in Drew Pearson and Tony Hill, and a defense that was adept at stopping the run as well as rushing opposing passers, although DE Ed “Too Tall” Jones had departed to try his hand at boxing and SS Charlie Waters went down with a knee injury in the preseason. In addition to the losses on defense, if there was a concern heading into the first week of the ’79 regular season, it was that star RB Tony Dorsett was injured and rookie Ron Springs would be filling in. The Cardinals had gotten off to a miserable 0-8 start in 1978, but won six of their last eight contests on the way to a 6-10 record. Legendary Univ. of Oklahoma head coach Bud Wilkinson had come out of retirement at age 62 and was back for a second year in St. Louis. QB Jim Hart was coming off a year in which he passed for a career-high 3121 yards, WR Pat Tilley had emerged as a quality possession receiver, and the offensive line was anchored by stalwarts in OT Dan Dierdorf, G Bob Young, and C Tom Banks. However, there was a lack of speed at running back, a situation that had been addressed by taking Univ. 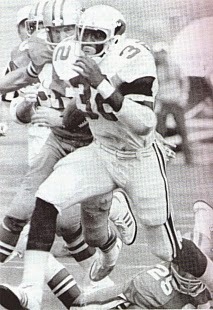 of Miami RB Ottis Anderson (pictured above) with the eighth overall pick in the first round of the NFL draft. There were 50,855 fans on hand at Busch Memorial Stadium. The Cowboys struck first in the opening period when Rafael Septien kicked a 37-yard field goal. They scored again on a four-yard run by FB Robert Newhouse in the second quarter and, with Septien’s extra point, were up by 10-0. However, a 33-yard run by Ottis Anderson set up a two-yard touchdown pass from Jim Hart to TE Al Chandler. Mike Wood added the PAT and the score was 10-7 at the half. Midway through the third quarter, Septien kicked a 24-yard field goal to extend the Dallas lead to six points. However, a fumble deep in Dallas territory by TE Doug Cosbie was recovered by St. Louis CB Roger Wehrli and set up the second touchdown for the Cardinals which came on an 18-yard pass completion from Hart to Pat Tilley. Wood’s extra point put the home team in the lead by 14-13. The Cowboys responded with a 79-yard drive. 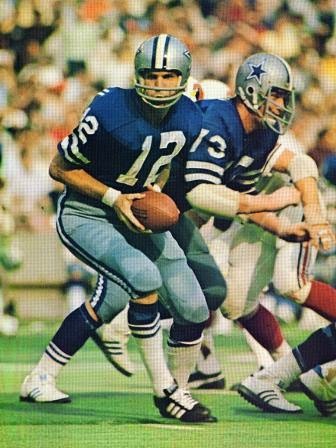 Roger Staubach completed passes of 12 and 21 yards along the way and the series concluded with Ron Springs throwing an option pass to Tony Hill for a 30-yard TD. Dallas failed to add the extra point but was back in front by 19-14 with 12:35 remaining in the game. The Cards were unable to move on their next series, but on the following possession Anderson broke away for a 76-yard touchdown run, and it seemed as though an upset might be in the making. Wood added the PAT and St. Louis was up by two points with time running down. DB Wade Manning returned the ensuing kickoff 47 yards to give Dallas good starting field position at the St. Louis 48. Newhouse gained 14 yards on two carries and Staubach completed a pass to Hill for seven yards. With 1:16 remaining on the clock, Septien booted a 27-yard field goal and the Cowboys came away with a narrow 22-21 win. Dallas led in total yards (455 to 342) and first downs (24 to 17). Both teams were productive on the ground, with St. Louis piling up 237 rushing yards to 161 for Dallas, but the Cowboys were far more effective through the air, compiling 294 net passing yards to 105 for the Cards. St. Louis also turned the ball over twice, to one turnover suffered by the Cowboys. Roger Staubach (pictured above) completed 20 of 34 passes for 269 yards and, while he threw for no touchdowns, he also gave up no interceptions. Robert Newhouse gained 108 yards on 18 carries and scored a TD. Ron Springs rushed for just 30 yards on 15 attempts but also threw the 30-yard scoring pass. Tony Hill caught five passes for 113 yards and a score and Drew Pearson was right behind with five receptions for 99 yards. For the Cardinals, Ottis Anderson was the star on offense with 193 yards on 21 carries that included the one long touchdown run. FB Wayne Morris contributed 41 yards on 10 attempts and had four catches for 28 yards. Jim Hart was successful on 12 of his 29 throws for 112 yards and two TDs, but also gave up two interceptions. Al Chandler had four receptions for 21 yards and a touchdown and Mel Gray and Pat Tilley each pulled in two passes apiece, for 32 and 31 yards, respectively. One of Tilley’s was good for a score. The narrow escape in St. Louis did not immediately portend trouble for the Cowboys, who got off to a 7-1 start on the way to winning the NFC East for the fourth straight year with an 11-5 record. They were upset by the Rams in the Divisional playoff round. The Cardinals won their next contest but lost the next three on the way to a 5-11 finish and the bottom of the division. Bud Wilkinson failed to last the year and Jim Hart found himself being challenged by former first draft choice Steve Pisarkiewicz. Ottis Anderson proved to be a bright spot amid the gloom in St. Louis. His outstanding opening week performance was the first of nine 100-yard rushing games on the way to 1605 yards on 331 carries (4.8 avg.). He scored a total of 10 touchdowns (8 rushing, 2 receiving) and received consensus first-team All-NFL as well as Pro Bowl honors. Anderson also was named NFC Player of the Year by The Sporting News and was the Associated Press selection for NFL Offensive Rookie of the Year.